Should You Choose Cold Calls, Emails or Both? Two tried and tested ways to get in touch with potential customers exist in sales: the cold call and the cold email. Some salespeople favor calls. Some reps swear by emails. But is one method of contacting a prospect better than the other? Read on to learn more about the benefits and drawbacks of both. The very mention of the cold call is enough to turn off some prospects, and even some reps. Who likes being interrupted in the middle of their workday to hear a sales pitch? Yet the sales cold call has historically been one of the most effective tools for sales reps.
One of the biggest strengths of cold calling is the control a phone call gives the sales rep, according to author and trainer John Chepyha. And then Chepyha tells reps to listen to what the prospect says. An open-ended question like his will result in one of three possible answers — yes, no or maybe — and an experienced cold caller will be ready for each of those answers. Cold call expert Kraig Kleeman loves cold calling for its yield. The problem with traditional cold calls, he said, is that people usually don’t want to be on the receiving end of one. “No-one — no-one — wants an unsolicited sales call. They run for the hills from that sort of thing,” he said. His cold calling methodology? Kleeman and his clients research the issues that are important to their target buyers, put together information that will interest those buyers, and call buyers to invite them to a 15-minute research briefing on those issues. The goal of his calls: Get prospects into a meeting so that reps can talk to the buyers and learn more about those buyers’ needs. “What sellers need to do is learn to lead with fact-based research that is highly relevant and highly germane to the professional mandates and the personal values, the core values, of their targets,” Kleeman said. Despite cold calling’s benefits, there are many reps who don’t like making calls; they fear failure and rejection. He’s not a huge fan of email because email lacks the same control. “You don't know whether it was read or not. You don't know what the reaction to it is,” he said. While a cold email doesn’t allow a rep to control a conversation the way they can when they're on the phone with a prospect, the cold email has a major advantage over the cold call — reps can send out a lot of email in a short span of time. The scalability of cold emailing is great for sales teams that don’t have the resources to make a lot of cold calls. The trick is to do your research, not to be spammy. The important thing to remember, Morgan said, is that you’re trying to start a conversation. Morgan said that most email campaigns should be aiming for a positive/neutral response rate of between 10-35%. If the response rate is less than 10%, something is wrong. Asked what she thinks about cold calls, Morgan said there’s no downside to being good on the phone — most reps will have to get on the phone with their customers at some point. Still, as people become more reluctant to pick up the phone, many reps are less and less interested in cold calling. “Some people might say ‘If you can't cold call, then don't be in sales,’ but as the world becomes increasingly digital, I think the salespeople who are not able to ‘sell digitally’ via email and social will be the ones that really fall behind,” she said. That said, why choose between calls and email? There is no need to eschew cold calling in favor of cold emails, or vice versa. 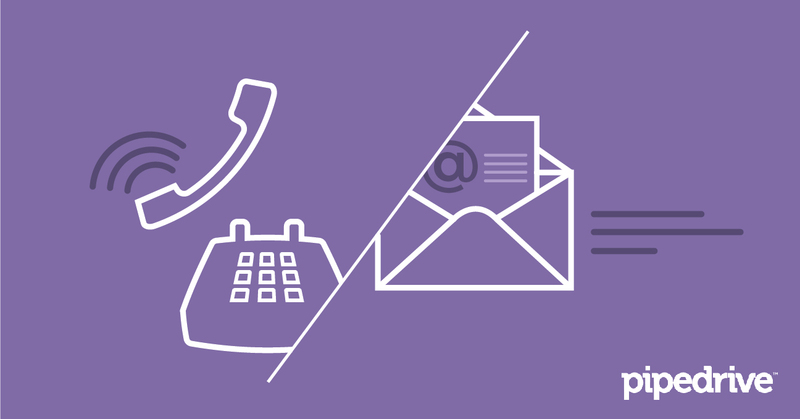 Both calls and emails are usually used together in sales campaigns. Asking which is better isn’t a fair question, Kleeman said. Morgan said that salespeople need to choose the method that works best for them, and especially for their prospective customers. “Know your audience, and do what makes sense for them. See what works, and triple down on that,” she said. Successful sales reps should be thoughtful. They should respect their prospects’ time and needs. Chepyha advises reps to acknowledge, upfront, the fact that a cold call is, essentially, an interruption. Sales calls and sales emails aren’t about the caller — they’re about the person you’re calling. Sales reps should try to get the prospects to talk about their needs, rather than rambling on about the product they’re selling. You’ll need several touches before you get a response. Chepyha said that a rep can expect to call a prospect about seven or eight times. Morgan says that emailers should send out eight emails to get the maximum response rate. If your pitch isn’t persuasive, it doesn’t matter what format you’re using to contact your prospects. If the script you’re using for your calls isn’t well thought-out, or if you’re just copy-pasting bad emails and blasting them out to everyone on your contact list, you’re not going to get a response. Want to learn more about cold emailing? Salesfolk is offering Pipedrive readers 30% off Morgan’s email course with the promo code ORANGEGOAT.